Hey everybody, it’s Jedd checking in. Hey, before I get into this post, does anybody know where I can pick up a pair of boots like this? That is an image of Frederick Winters from the 1904 Summer Olympics. Seems like a crazy get-up for the summer time, but to each his own. Speaking of summer, I hope everybody’s summer is rolling smooth. We have had a cool and rainy one here in Pennsylvania, but that seems to be turning around now. Tonight it was so hot in my new garage that sweat was dripping off my head onto everything I was trying to lift in the gym. I was trying to pinch 3-25’s plus weight, but didn’t quite get a full pull and my camera battery was dead so I have no video anyway. It was so hot, even with shorts and a tee shirt on, i still felt like I was wearing ol’ Frederick’s wardrobe shown above. Grip strength training can be a lonely endeavor. Unlike team sports, usually a grip strength practitioner undertakes his obsession by himself in a dusty basement surrounded by storage boxes, or in a small portion of the garage that’s just big enough to house a garage gym. When he beats a personal record, the radio and perhaps a pet are the only things around to share in his excitement. When he hears terms like hub lifts, pinch grip, CoC #4, or sledgehammer leveraging, he understands perfectly. When he tries to explain these terms to his friends and family, they rarely understand (or want to for that matter). How important is hand strength for throwing sports (shot, discus, javelin)? Who inspires Bill Piche in the Grip World? What is the KTA gripper program, and how can it help you close heavier grippers? What accomplishment is Bill most proud of as far as the Gripboard is concerned? Go to Grip Strength Radio to listen to this show. ===> Grip Strength Radio. That’s the response I got after sending the Nail Bending eBook to someone this week. That’s right – The Nail Bending eBook is 188 pages of instruction. You can rest assured that if you buy a product from Diesel Crew, you are getting your money’s worth, plus some! I’ve been where you are. You buy an ebook product for like $50 only to find out that you just paid a buck a page and you already knew most of the stuff in it. That won’t happen with the Nail Bending eBook. 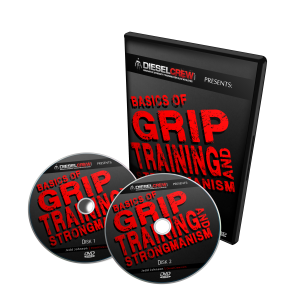 In it, you will find out how to bend a variety of pieces of steel – nails, bolts, and stock; you will find out how to wrap the steel so you don’t puncture yourself; you will find out how to ramp-up into a bending program without getting hurt from cumulative trauma. You will know how to climb to the top of the steel bending ladder. And all of this for just $39.97. 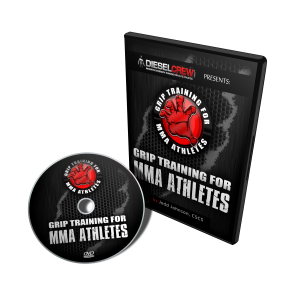 A safe investment and you’ll be learning to do cool sh*t.
For too many athletes, wrist training means sitting down on a bench and hitting some wrist curls – WASTE OF TIME!!! With baseball season about to start, I’ll show you just how easy it is to train the wrist from all angles effectively and efficiently. For more wrist training ideas, check out the Nail Bending eBook. That’s the first line of this video clip. And that was my initial thought when I saw it featured in my Recommended Videos when I logged onto YouTube, clicked on it, and saw the views it’s gotten – over 37,000! Awesome! 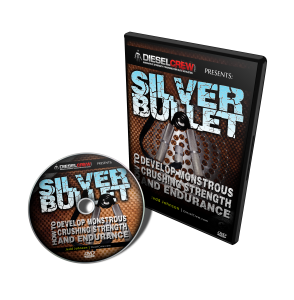 For more outstanding Diesel Footage, you’ve gotta check out our famed DVD, The Sh*t You’ve Never Seen. My latest article on Straight To The Bar is up! In it, I look at an easy way you can use a kettlebell and a JumpStretch band to build sick strength in your lower arms. Kettlebell Training for Grip Strength.